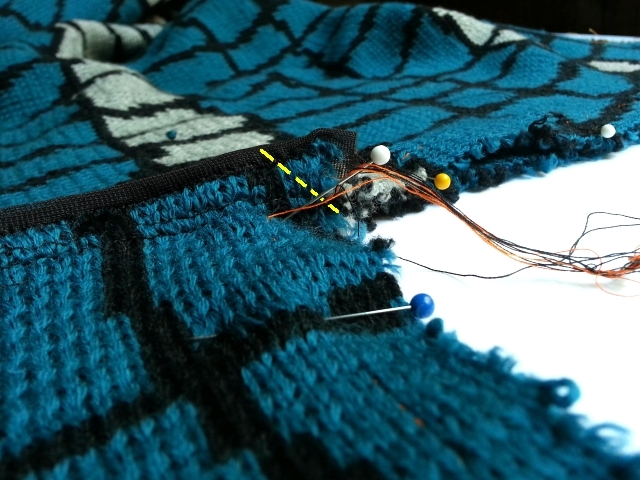 When last I worked on the shawl collar cardigan, I had just attached a sleeves using the flat method, as written in the pattern instructions. 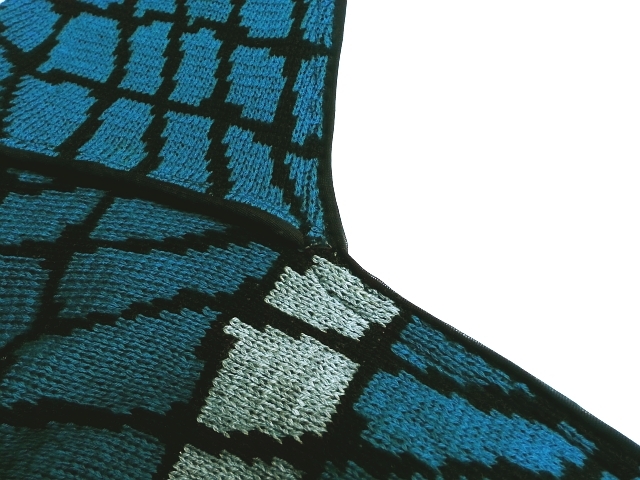 I then bound the seam allowances with thin nylon, knit mesh. Now is the time to sew the side seams. My off-kilter plaid fabric is a substantial sweater weight, double knit fabric. What I don't want is for the seam allowances to be too thick and bulky under the arm where side seam and sleeve seam meet. I'm at step 6 in the written instructions, where I'm to "pin front to back, right sides together at side seam and sleeve seam [...]" Before sewing this seam, I trimmed corners off the seam allowances at the underarm. Can you see it in the picture above? In the foreground is my sleeve with the seam already pinned. The bound seam (in the left half of the pic) is the seam that attaches the sleeve to the body. That broken yellow line is where I trimmed. You may be able to see it better in the diagram below. Click to enlarge. I trimmed the yellow triangles before sewing the sides and sleeve seams. The top photo is the "before". Here is the "after". This time the sleeve is at the top of the pic. If I were sewing this for demonstration purposes only, I'd probably have chosen a lighter color, plain fabric, another color binding, and contrasting thread. I hope the picture is clear enough to see that this really does get rid of bulk. Another place where seam allowances can get bulky is where the shoulder seam meets the top of the sleeve. I could have clipped the corner of the shoulder's seam allowance before sewing on the sleeve. It really didn't seem to be a problem, however. The end is near. Next I'll sew on the Front Band a/k/a the shawl collar, and I'll hem this thing.